Apr. 19, 2013 9:00 a.m. Note by Barry McDonald: Travel is a character changing experience. When we return home, especially from a major international trip, we view our home town, province and country differently than before we left. Ian Ruskowsky has become a changed person as he serves his term in Ashoro, Japan as coordinator of the Wetaskiwin/Ashoro exchange program. Now he reflects on his experiences while observing 14 students visiting Japan from Wetaskiwin. The Pipestone Flyer is proud to be working with Ian to create this series of articles and follow his experiences while living in Japan. The Flyer is delighted to be able to share these with our 23,000+ readers. 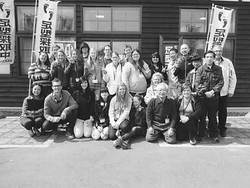 On March 26th, 2013 fourteen students accompanied by four chaperones left Wetaskiwin on a Study Tour of Japan and returned on April 6th with new ideas, new thoughts and new ways of viewing life. This cultural exchange trip was the 7th student exchange since Ashoro and Wetaskiwin were twinned in September of 1990. Many of the delegates had previously travelled outside Alberta and Canada but as Ian Ruskowsky, Coordinator of International Relations, Ashoro-cho, Japan observed, “this was the first time for them to truly integrate, understand and become part of the culture that I now call home”. “Being on the other side of the coin and getting to observe the wide eyed wonderment and answer the very same questions I had when stepping into Ashoro myself, was a real treat.” While observing the students, Ian was reminded of his first introduction to all the little differences between Japan and Wetaskiwin; the same little differences that continue to remind him that the rural farm near Falun and the City of Wetaskiwin are a long way away from his new home. “Once the students were on the bus I overheard conversations about differences the students had noticed. I heard Liam Murphy exclaim in wonderment, ‘Hey did anyone notice that spot on the mirror in the hotel room that didn't fog up when you take a shower?’ followed by Tabatha Wallace’s response, ‘yeah, they have anti fog on the mirrors but no garbage cans anywhere!’ It was amazing to hear this discussion branch out to comments on the large number of vending machines they had seen, the extreme politeness of every person they had met and even the toilets that talk to you.” These are all things that have become ‘normal’ for Ian. But he noted, “this reminder via a group of energetic Jr. High and Sr. High School students was the perfect way to get me back in touch with the way travel and living abroad seems to have changed me”. “Ashoro has kindly accepted me as one of their own through getting to know families on a personal level, involvement in community events, developing friendships and maintaining a healthy interest in their culture. In their short stay the students got an abbreviated version of what I have been experiencing but I believe the impact was just as great, if not greater. As the students were saying their final goodbyes to their home stay families you could see them fighting the tears and searching for words and actions to express their gratitude. Taylor Gardiner said ‘I finally found a little sister’ as she played the last game of hand slap with Izumi, a nine year old girl from Ashoro who's family was involved in the home stays. Gwendalinn Wilson sadly shared her feelings with, ‘I don't know if I can leave?’ as the 5 year old and 3 year old Sakami sisters held her hands tightly before she had to depart.